Guardians of the Galaxy (2014) | Tales From The Ipe! Saturday evening, Nums and I took the kids out for dinner and a movie, to celebrate our “Date-aversary” (14 years and counting.) For dinner, we tried our this interesting “fast super casual” Mexican place called Mexican Mariachi Grill. I’ll admit that it wasn’t particilarly fast, but it was pretty good and we still made 8:30 pm movie showtime for…. Guardians of the Galaxy (2014). The film stars Chris Pratt (Andy Dwyer! AKA Burt Macklin!) as Peter Quill. Kidnapped by aliens in 1988 as a young human boy from Missouri, it is now 26 years later. He is a tomb raider / thief who travels parts of the galaxy stealing artifacts, building up a criminal history, and sleeping around with a lot of alien women. He eventually steals an orb from Thanos, and becomes the bounty target for multiple individuals. 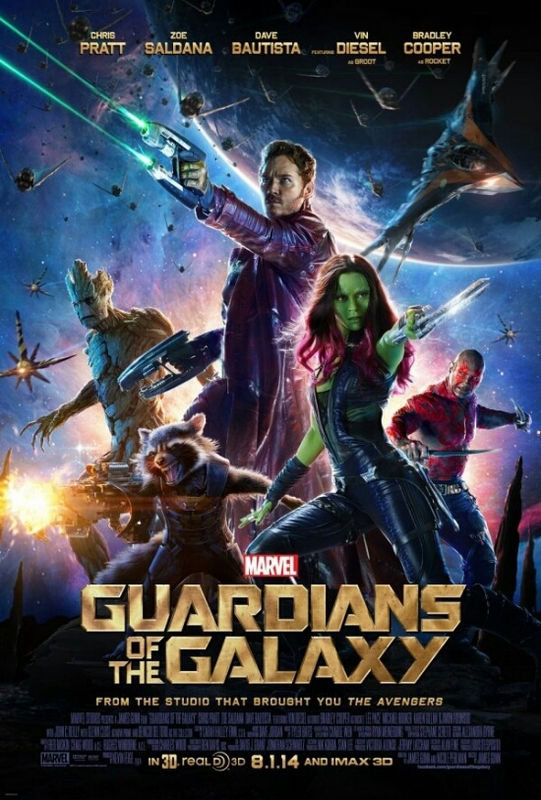 This includes Thanos’ adopted daughter Gamora (Zoe Saldana), Rocket (voiced by Bradley Cooper) and Groot (voiced by Vin Diesel.) They all get arrested by the Nova Corps and locked up in The Kyln, a high security interstellar prison. The four eventually meet another prisoner named Drax (wrestler Dave Bautista), and they all band together to escape from prison, sell the mysterious orb, and survive the attempts by multiple villains to kill them and take the orb. Yes, the film has a short role for Thanos, the connecting piece of the overall plot linking the Marvel Cinematic Universe (MCU) together. Voiced by James Brolin, you will actually see Thanos visualized on the big screen. Definitely a plus. Directed and co-written by James Gunn, I thought it was a well done film. Lots of laughs, lots of good character development, and good music. It is a definite must-see this summer. We saw it in regular non-3D, which was fine. This entry was posted in Personal and tagged chris pratt, infinity stone, james gunn, marvel, marvel cinematic universe, mcu, movies, sci-fi, thanos, zoe saldana. Bookmark the permalink.